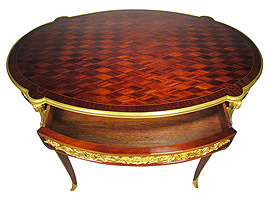 A Very Fine French 19th/20th Century Louis XV Style Oval Gilt-Bronze Mounted Mahogany, Walnut and Satinwood Veneered Parquetry Occasional Center Table fitted with a frieze drawer, attributed to François Linke (1855-1946). 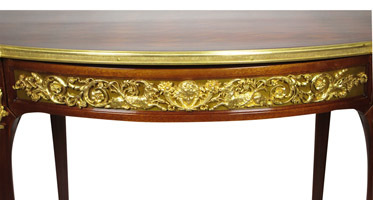 The top with a diamond-shaped parquetry design within a banded gilt-bronze rim, the frieze surmounted all around with allegorical masks of maidens, playful Putti, cornucopias, rams, musical instruments, ribbons, acanthus and vines, each leg with ram-heads mound and gilt-bronze sabots. (Unsigned/unmarked). Circa: Paris, 1895-1910. 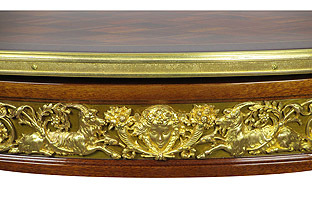 François Linke (1855-1946): Considered the finest French cabinet maker of the late 19th and early 20th century. By 1875, Linke who was born in Pankraz Bohemia, had arrived in Paris and established an independent workshop. His early works were mainly copies of important eighteenth century models. 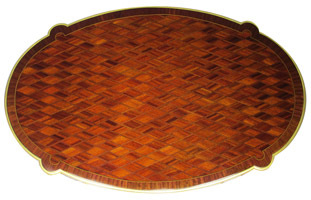 Linke received major attention at the Paris Exposition Universelle when he presented his totally new style, of Rococo with the addition of the new ‘art nouveau’ fluidity. He was awarded the gold medal for his extraordinary Grand Bureau. Linke also exhibited at the 1904 St. Louis World’s Fair, Liege in Belgium, and the Franco-British exhibition in London in 1908. 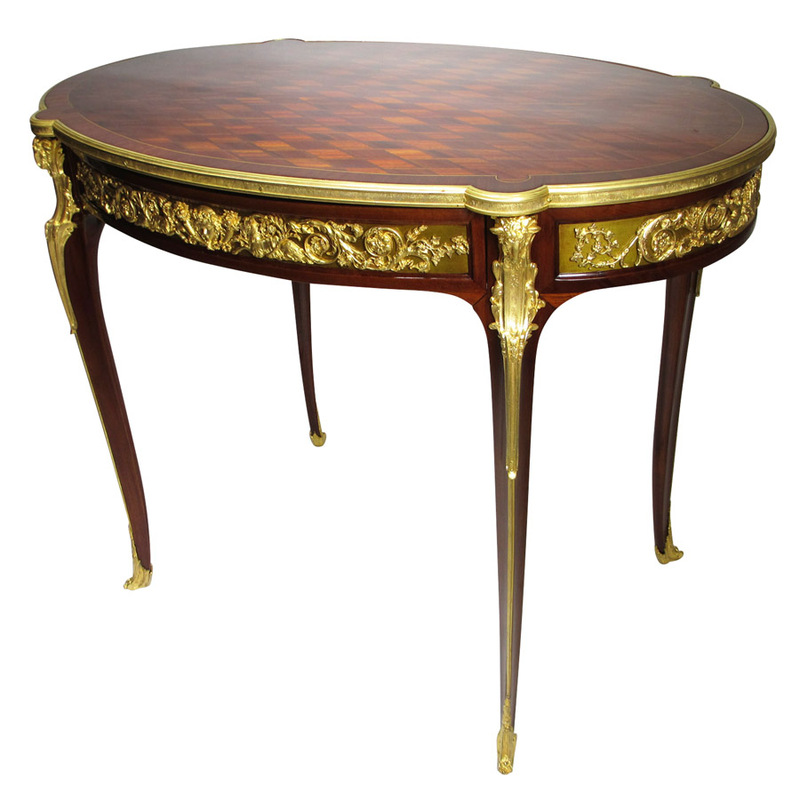 His work has long been admired for its exceptional quality and innovative interpretation of the Louis XV and Art Nouveau styles. 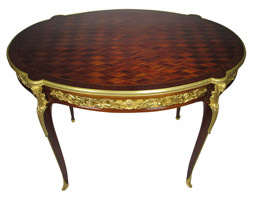 A Very Fine French 19th/20th Century Louis XV Style Oval Gilt-Bronze Mounted Mahogany, Walnut and Satinwood Veneered Parquetry Occasional Center Table fitted with a frieze drawer, attributed to François Linke (1855-1946). 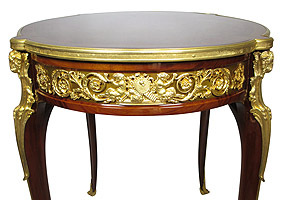 The top with a diamond-shaped parquetry design within a banded gilt-bronze rim, the frieze surmounted all around with allegorical masks of maidens, playful Putti, cornucopias, rams, musical instruments, ribbons, acanthus and vines, each leg with ram-heads mound and gilt-bronze sabots. (Unsigned/unmarked). Circa: Paris, 1895-1910. 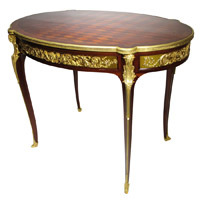 François Linke (1855-1946): Considered the finest French cabinet maker of the late 19th and early 20th century. By 1875, Linke who was born in Pankraz Bohemia, had arrived in Paris and established an independent workshop. His early works were mainly copies of important eighteenth century models. Linke received major attention at the Paris Exposition Universelle when he presented his totally new style, of Rococo with the addition of the new ‘art nouveau’ fluidity. He was awarded the gold medal for his extraordinary Grand Bureau. Linke also exhibited at the 1904 St. Louis World’s Fair, Liege in Belgium, and the Franco-British exhibition in London in 1908. 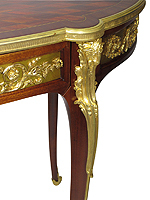 His work has long been admired for its exceptional quality and innovative interpretation of the Louis XV and Art Nouveau styles.